The KV-85 Soviet WW2 tank weighed 50.7 tons and required a crew of 5; Commander, driver, gunner, loader and machine gunner. It was powered by the same engine that powered the KV-1 tank, a 12 cylinder 45 litre Mikulin 600hp V-12 engine that enabled the KV-85 to manage a top road speed of 40 km/h (29 mph). It was armed with an 85mm D-5T high velocity gun. It was a shorter derivative of the original 85 mm Anti-Aircraft gun. It had a muzzle velocity of 792 meters per second (2,598 ft/s). It was the same 85 mm D-5T gun as mounted in the SU-85 and early versions of the T-34/85 tank. The 85 mm proved capable of penetrating the Tiger I from 1000 m. The tank had storage for 60-70 rounds. It had three DT 7.26 mm machine guns. The KV-85 had armor thickness of 60 mm on the hull, 75 mm on the frontal glacis, to 100-110 mm turret front, sides and rear. All the armour was slopped or curved to provide additional protection and help deflect incoming enemy shells. 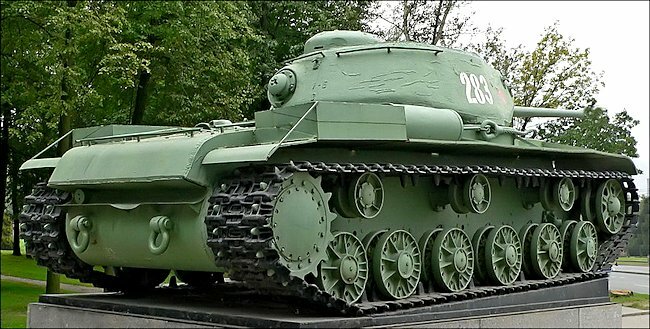 There is only one KV-85 tank left in the world and this is it. 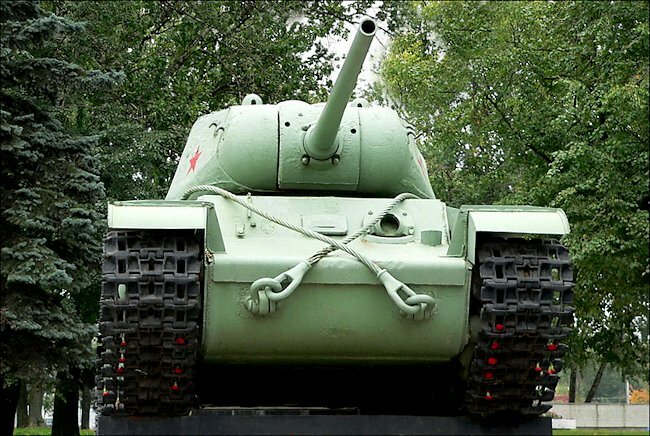 The Kliment Voroshilov (KV) tanks were a series of Soviet heavy tanks named after the Soviet defense commissar and politician Kliment Voroshilov and used by the Red Army during World War II. They were later replaced by the IS (IS - Joseph Stalin) series of tanks. In 1942 the Red Army were combatting up gunned and up armoured German tanks. The 76mm gun fitted to the KV-1 and T34/76 needed replacing if it was to destroy new tanks, like the Tiger 1, that were starting to coming off the German production lines. The KV-85 tank was really a stop-gap tank. Based on the KV-1S tank with a new turret, it was manufactured and introduced into operational service adue to the delayed development of the IS-1 heavy tank before mass production was authorised. This is why only 148 were built between late 1943 and early 1944. They saw operational service across the eastern front from the Crimea in the south to the Prussia in the north. Where can I find other preserved KV-85 Tanks?